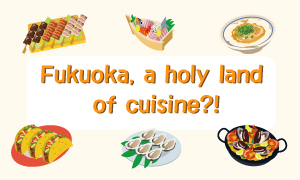 Fukuoka, a holy land of cuisine?! Where are you going to visit in Japan? Fukuoka, of course! Fukuoka is close to the sea! Fukuokans feel close to the sea! How the sea affects life in Fukuoka. Asia, always by our side! Fukuoka, a hub city where people, products and events gather! Fukuoka, a great place to live even compared to Tokyo!